Dr. Feldman literally saved my life. He saved my ability to do everything I need and want to without having to worry about the future. I loved to run, but I started to have pain in my groin and hip when I ran long distances. I couldn’t lift my leg to get in to my car. I thought that I had a minor injury, but I went to see a local orthopedic surgeon. After an X-Ray and an MRI, he informed me that I had hip dysplasia. He told me I should stop working out, and prepare for the fact that I would need a hip replacement fairly soon. I was 29 years old at the time. I have a 5 year old daughter, and I am a critical care nurse. I was preparing to go to graduate school at NYU in the fall. This was a crushing blow to my life. I couldn’t face the severe limitations, and the possible need for revision of the implanted appliances every 10-15 years. I reached out to Dr. Feldman, hoping for more information, and a more realistic answer. Dr. Feldman saw me immediately. He told me there was a procedure he could perform to preserve my own hip, and prevent the need for multiple surgeries in the future. With this procedure, it was likely that I could maintain a more normal level of physical activity. He was honest about what to expect during and after the procedure. He told me not to worry about NYU, and that it would be likely I could attend after the surgery. His nurse Ella was warm, compassionate and thorough during the pre-surgical screening process. They were able to schedule the procedure the same day as the initial consultation, and I had surgery within 6 weeks. His staff were extremely helpful with navigation of the financial and payment aspects of the situation. After the surgery Dr. Feldman was very proactive about managing my pain, and listening to my concerns. When the pain medication he prescribed wasn’t working well he immediately sent me to a wonderful pain management specialist and had the problem corrected the same day that he became aware of it. Ella called me on a regular basis to check on me, and guided difficult tasks such as monitoring my diet, wound care and listening to my emotional concerns. Dr. Feldman has been extremely motivational, patient and reassuring during the postoperative recovery period. I am now back to the gym doing the activities I love, walking around the campus at NYU, working and chasing my beautiful daughter. Not a single one of those things would currently be possible if it wasn’t for the amazing care that Dr. Feldman has provided. I am eternally grateful to him and his staff. They saved my future and my quality of life. 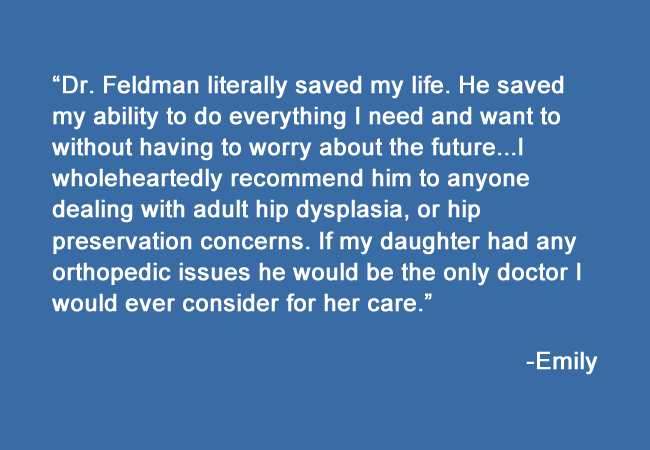 You could not find a more technically skilled, honest or supportive surgeon than Dr. Feldman. I wholeheartedly recommend him to anyone dealing with adult hip dysplasia, or hip preservation concerns. If my daughter had any orthopedic issues he would be the only doctor I would ever consider for her care.